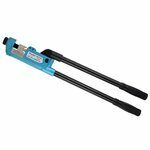 Ratchet crimping tool for non-insulated open barrel connectors (male, female), Mini-Fit connectors, D-Sub V.35 connectors. AWG: 14-22. 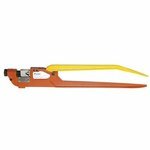 Ratchet crimper designed for non-insulated pin terminals and insulated ring terminals. DIN: 4-6, 10, 16, 25 mm². 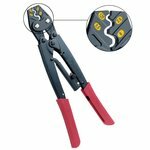 Ratchet crimping tool for non-insulated ring and fork terminals. Wire cross section: 10, 6, 2.5, 1.5 mm². 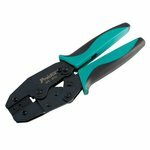 Crimper for cables from 10 mm² to 95 mm²: aluminum (8 AWG to 4/0) and copper (8 AWG to 250 MCM). OAL: 570 mm. 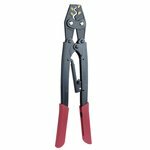 Ratchet crimping tool for non-insulated ring and fork terminals. Wire cross section: 4-6, 10, 16, 25 mm². 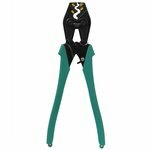 Perfect for crimping various non-insulated terminals. Ratchet crimp action provides reliable terminations. 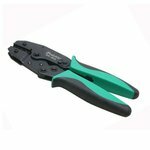 Crimper for cables from 10 mm² to 120 mm²: aluminum (8 AWG to 4/0) and copper (8 AWG to 300 MCM).